Spectacularly situated over-looking Loch Fyne the garden contains many Champion Trees including one of the tallest trees in Britain and the "Mightiest Conifer in Europe". 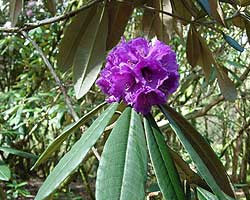 Throughout the spring and early summer the fine rhododendron collection and carpet of fragrant bluebells create a riotous display of colour. Autumn is equally attractive, the vivid colours within the Sorbus collection and the Cercidiphyllum gorge contrasting with the delicate hues of the oak and beech. Benmore, a regional garden of the Royal Botanic Garden Edinburgh, is a magnificent woodland garden set in the stunning Cowal Peninsula. 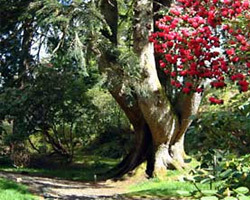 Its 140 acres, entered via a Giant Redwood Avenue forming one of the finest entrances to any botanic garden in the world, contain a wide collection of flowering trees and shrubs including over 300 species of rhododendron and over one third of the world's winter hardy conifer species. Way marked walks lead to a pond, formal garden and viewpoint at 450 feet (140m) and access to the recently restored Victorian Fernery. A spectacular 50-acre woodland garden in a dramatic setting. Crarae has a wonderful collection of woody plants centred on the Crarae Burn, which is spanned by several bridges and tumbles through a rocky gorge in a series of cascades. 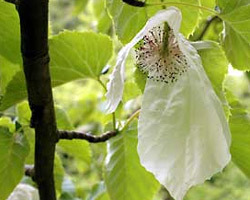 A wide variety of shrubs and trees chosen for spring flowering and autumn colour grow in the shelter of towering conifers, and the lush, naturalistic planting and rushing water gives the feel of a Himalayan valley. 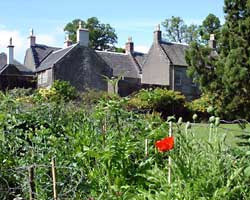 There are a fantastic array of gardens in the surrounding area, The Gardens of Argyll website provides a fabulous resource for discovering them all. The group comprises 20 gardens varying in size, style and maturity, dating from the 13th to the 20th century. They are spread throughout the mainland of Argyll, often in dramatic scenery, and to the islands of Bute, Colonsay, Gigha, Jura, Mull and Seil.